Saint Haralambos was a priest of the Christians in Magnesia, the foremost city of Thessaly, in the diocese having the same name. He contested during the reign of Alexander Severus (222-235), when Lucian was Proconsul of Magnesia. At the time of his martyrdom the Saint was 103 years of age. The following miracles are told by the nuns of St. Stephen's Monastery at Meteora of Thessaly, which houses the holy skull of St. Haralambos. Saint Haralambos has a special gift of healing pestilential diseases, and has often halted epidemics of typhus, cholera and the plague. In 1908 a deadly epidemic reached Mt. 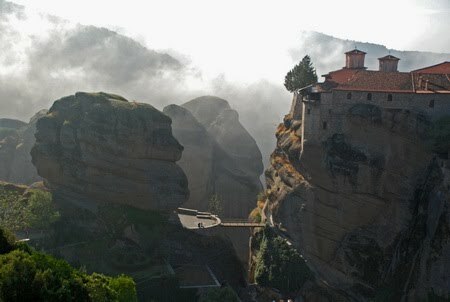 Athos, and the holy skull of the saint was taken from St. Stephen's on Meteora to the Protaton on Mt. Athos, where an all-night vigil was served. The epidemic halted immediately, and since then, each year, the monasteries celebrate an all-night vigil honoring St. Haralambos - the only saint besides the Mother of God to be so honored by the entire population of the Holy Mountain. In 1950, Maria Nairi's four-year-old daughter became paralyzed. Unable to help her, the doctors could do nothing for the child and sent her home to die. After many nights of prayer, Maria saw St. Haralambos in a dream, and borrowing an icon of him from her church, kept it in her home for forty days with a lamp lit before it. On the eve of the Feast of the Holy Apostles (June 30), the saint appeared to the child and healed her. The room was filled with an indescribable fragrance and sweet-smelling myrrh flowed from the icon. On the west coast of Greece there is a church dedicated to the saint in thanksgiving for saving the town from a typhoid epidemic. 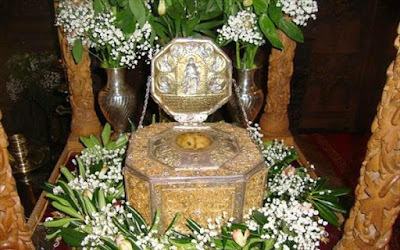 One year St. Haralambos' feast fell in the week before Great Lent. In Greece, as in other parts of the world, this week is often celebrated with a secular carnival. A couple, who were passing by the church on the eve of the saint's feast, heard the singing for the vigil. The wife wanted to go in for the service, but the husband blasphemed the saint and said that he would go to the carnival instead. He was immediately stricken dumb. His wife took him into the church where he knelt and repented, and he regained his speech exactly a year later, on the feast of St. Haralambos. In 1966, a Mr. Nikolaou was returning to his native village where he planned to retire, carrying with him his life savings. Reaching his village, he was horrified to discover he had lost the money. The next morning he set off again for Piraeus, hoping somehow to trace it. When he reached the village of Paligoyrgos, he saw a small chapel dedicated to St. Haralambos and went in to beseech his aid. Immediately he heard a voice telling him to look under the seat of the car in which he had ridden part way home the day before. He traced the car and found that the money had indeed fallen under the seat. A man with an incurable and extremely painful disease prayed to St. Haralambos frequently and fervently to heal him. Finally one night the saint appeared and told him that his sufferings were much less than those endured by Christ and that it would be better for him to bear his illness patiently than to have it cured, because it had been sent by God to help him work out his salvation. In 1978, a young woman came to St. Stephen's Monastery to be a monastic. She was clothed as a novice, but suffered terribly during her first few months because she was torn by her separation from her family. Her older sister came to visit, but only made the novice's sorrow greater by begging her to leave the monastery. In vivid colors she painted a picture of their parents sitting, night after night, heavy-hearted with grief at the absence of their youngest daughter. That night the elder sister slept in the monastery, and towards dawn she had a dream of St. Haralambos, who sternly reprimanded her for trying to make her sister leave, saying that it would greatly harm the young girl if she gave up the monastic path. As he scolded her, he slapped her hard across the cheek and she woke up feeling the sting of his hand. Needless to say, she obeyed, and one of the sisters who knows her says that, to this day, her cheek tingles from the sting of the slap. In January 1995, a woman came to visit the monastery from the town of Trikala and told the sisters that she had been childless for the first nineteen years of her marriage, and that doctors had told her she would never conceive. At the beginning of 1994, she began praying to St. Haralambos, who appeared to her one night in a dream and said not "You will have a child," but "You will have children." Two months later the woman conceived and at the end of the year gave birth to twin boys. She comes often now to visit the monastery with her little sons. In the early 1990's, a young man from the village in the area came to St. Stephen's Monastery with the intent to commit suicide by throwing himself off the bridge that connects the pinnacle of the rock to the road. He was standing on the bridge looking down into the chasm and preparing to jump, when an old priest came up and introduced himself as the spiritual father of the monastery. Although they had never met before, he began speaking to the young man about his life and trials, and encouraged him not to despair, promising him that God would help him. The young man felt an inner joy and peace. Going back to his home he began to attend Divine Liturgy regularly. A few weeks later he went to the monastery again and asked to speak to the old priest. The sister whom he met at the door told him there was no priest living there, that priests only came occasionally from the outside to serve Divine Liturgy, nor had there been any priest there on the day he mentioned. 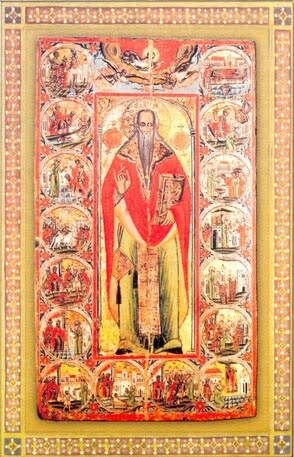 She asked him what the old priest had looked like, and he described in detail - St. Haralambos. O wise Haralambos, you were proven an unshakable pillar of the Church of Christ; an ever-shining lamp of the universe. You shone in the world by your martyrdom. You delivered us from the moonless night of idolatry O blessed one. Wherefore, boldly intercede to Christ that we may be saved. O Priest-martyr, athlete, champion Haralambos, your relics are a priceless treasure of the Church. Wherefore she rejoices, glorifying the Creator. From Evlogeite! A Pilgrim's Guide To Greece by Mother Nectaria McLees, pp. 438-441.